Congratulations to the 2019 Excellence in Action Award Recipients! 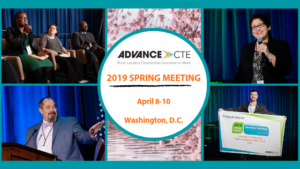 During the 2019 Spring Meeting, Advance CTE held an award ceremony to recognize the eight Excellence in Action award recipients that represent some of the best Career Technical Education (CTE) programs in the country. Hailing from seven states, these programs provide clear pathways into college and careers, rigorous academic and technical coursework, strong industry partnerships, and effective work-based learning experiences that offer opportunities for career exploration and subject-matter mastery. Award recipients traveled across the country to be recognized in front of state and national leaders. Hannah Chan, the Program Manager of the Academy of Finance at Como Park Senior High School in Minnesota, stated that the program is near and dear to her heart because she is a first-generation college student and wished she had this type of program when she was in high school. The Academy of Finance program serves a diverse student population with 88 percent minority learners and 31 percent English language learners served in this program. Nels Lawrence, the instructor for the Manufacturing program at Kaukauna High School in Wisconsin, spoke about how he has taught learners who now serve as employers and partners mentoring his students. He stated that the awards program is an example of the type of publicity CTE programs need to change the old perceptions. Following the ceremony, attendees were invited to participate in the gallery walk event. During this event, attendees could visit the award winner recipients and ask them questions about their programs. Award winners had tables with brochures, and even video presentations to help attendees get to know their programs better and see learners in action. Learn more about the 2019 Excellence in Action awards here. Posted in Uncategorized | Comments Off on Congratulations to the 2019 Excellence in Action Award Recipients! Learn more about each winner here. On April 15, applications became available for the Perkins Innovation and Modernization Grant Program to create, develop, implement, replicate, or take to scale evidence-based, field-initiated innovations that modernize CTE, increase program effectiveness and alignment, and improve student outcomes. Over $2 million in total are available for this grant, and up to six grants will be awarded to scale evidence-based innovative programs that lead to better student outcomes and program effectiveness. A webinar will be held by the U.S. Department of Education on April 25 to provide additional information. Read more about this opportunity here. To make sure you get the latest news and resources about federal policy that affects CTE, sign up for our Legislative Updates! A high-quality program of study should include opportunities for learners to learn real-world skill through hands-on, work-based learning experiences such as apprenticeships. In this video, hear from 2019 Excellence in Action Award recipient Nels Lawrence of the Kaukauna Manufacturing program of study in Wisconsin. Get an inside look at the state-of-the-art machine shop equipment that uses industry-standard, computer-aided design software such as SolidWorks and AUTOCAD. The manufacturing industry has evolved to include more advanced technical skills and these learners are receiving the hands-on learning they need to be competitive in this career field. The Data Quality Campaign released a new infographic that shows how access to data can help learners and families navigate the many choices along the education and workforce journey. The infographic follows one student, Grace, as she uses data to make important decisions that help her reach her goals. Read more about what can be achieved when learners and their families have data throughout their journey and the steps state leaders can take to help make this happen in their communities. Learn more and download the infographic here. This year’s Spring Meeting covered an array of exciting topics. Advance CTE staff reflects on the meeting in this three-part blog series. At the 2018 Spring Meeting, Advance CTE formally launched our initiative on equity in CTE with a panel and breakouts devoted to that topic. This year I had the great honor of presenting on the results of that work so far, including the adoption of Advance CTE’s Statement on Equity in CTE, as well as the release of three publications under the Making Good on the Promise series. I then moderated a panel of national experts on equity topics to reflect on how we can continue to tackle this work as a community of state and national leaders. The panelists were: Kisha Bird, Director of Youth Policy, CLASP; Nina Salomon, Deputy Program Director, Council on State Governments Justice Center; and Johan Uvin, President, Institute for Educational Leadership. The panelists discussed using data to ensure equitable resource distribution, developing partnerships across agencies and states to further equity efforts, and how state agencies can increase diversity within their own hiring practices. States have numerous opportunities under Perkins V to advance equity for each learner using CTE, but they will require bold action and some tough conversations. I am excited to continue to support our members in this work. 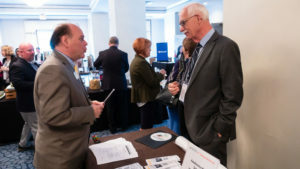 Drawing on the content of the Making Good on the Promise briefs, Advance CTE hosted a series of equity breakouts during the 2019 Spring Meeting. These equity breakouts challenged state leaders to think about how they can examine and use data to define the equity problem in their respective states; build trust with historically marginalized communities; ensure access to CTE opportunities for each learner; design a supportive environment for each learner; and deliver equitable outcomes for learners. I was one of the facilitators for the equity breakout that focused on building trust with historically marginalized communities. I was struck by how open and honest state leaders were about equity gaps in their respective states and their commitment to closing those gaps. Participants in the session discussed how to engage historically marginalized communities and message high-quality CTE to appeal to various populations. As state leaders continue to work towards closing equity gaps, I’m excited to see how they will be bold in their approaches. At last year’s Spring Meeting, I moderated a discussion about the prospects and plans for the reauthorization of the Carl D. Perkins Career and Technical Education Act of 2006 and while I remained optimistic, it was unclear if the law would be reauthorized in the 115th Congress. Fast forward one year and the reauthorization – the Strengthening Career and Technical Education for the 21st Century Act (Perkins V) – has been on the books for more than eight months! However, we certainly wouldn’t be in this position without the leadership of the law’s co-sponsors in the U.S. House of Representatives, Congressmen Raja Krishnamoorthi (D-IL) and Glenn ‘GT’ Thompson (R-PA). Advance CTE was thrilled to have these two dedicated CTE champions join us at this year’s Spring Meeting and I was honored to have the privilege of moderating the conversation. During this session, the Congressmen discussed why they got involved in the reauthorization. Representative Thompson (R-PA) shared how CTE “is a significant rung on the ladder of opportunity,” while Representative Krishnamoorthi (D-IL) discussed how CTE plays a role in restoring America’s middle class and connecting to postsecondary education, as he pointed out that, “Even if a four-year degree isn’t in everyone’s plans, a quality postsecondary education has to be.” Both Congressmen are looking forward to the implementation of the law and emphasized the importance of engaging the many stakeholders that CTE has and the opportunity to coordinate and collaborate with business and industry leaders. When asked about how the federal investment in CTE has made a difference in their districts, Representative Krishnamoorthi (D-IL) described an automotive technology program in his district that enrolled nearly the same number of male and female learners and how the program was making in a difference in his community and Representative Thompson (R-PA) told a story about how a CTE program in Pennsylvania was transformational in the life of a learner with a disability. 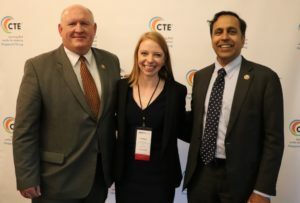 The bipartisan agreement about the value and promise of CTE was clear – Representatives Thompson (R-PA) and Krishnamoorthi (D-IL) have visited each other’s districts and enjoyed sharing about their joint appearances and interviews. It’s not a surprise as to why – the energy and excitement they have for CTE is sure to inspire any audience, let alone a room full of CTE leaders at our Spring Meeting! How many girls of color earned an industry-recognized credential in Information Technology last year? What types of work-based learning experiences lead to the best wage outcomes for learners from low-income families? How many graduates from Career Technical Education (CTE) programs in advanced manufacturing go on to work in their field of study? A strong, well-aligned data system allows State CTE Directors and other state leaders to answer these questions and more. But according to the latest State of CTE report, The State of Career Technical Education: Improving Data Quality and Effectiveness, these data systems are not meeting the need for data-informed decision making. While the report finds that 86 percent of State CTE Directors believe improving and enhancing their CTE data systems is a priority, only 45 percent say they have the information they need to assist in making decisions about CTE program quality and other initiatives at both the secondary and postsecondary levels. Making decisions about CTE program quality and equity without sufficient data is tantamount to sailors navigating the stormy seas using old maps and constellations rather than modern GPS technology. What is the cause for this gap? 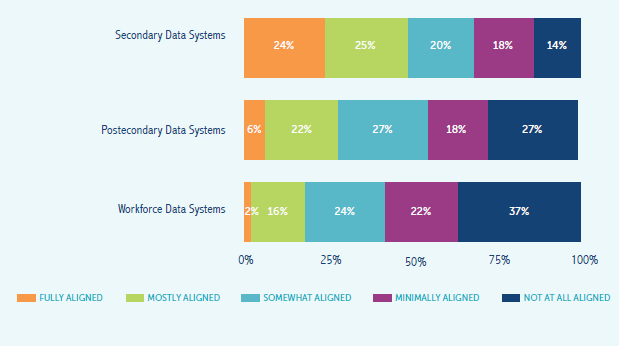 For one, state data systems are not sufficiently aligned across the secondary, postsecondary and workforce sectors. According to the survey, less than half of State Directors say their CTE data system is “mostly” or “fully” aligned with secondary data systems, 28 percent with postsecondary data systems and 18 percent with workforce data systems. Ensuring learners are prepared with the skills and experiences they need for high-wage, high-skill employment in in-demand occupations is a shared responsibility among secondary education, postsecondary education and the workforce sector. Yet too many states continue to use disparate data systems for collecting, validating and accessing learner-level data. Using disparate systems not only increases the data collection burden for local leaders but also threatens the quality of the data and the ability of state leaders to use their data effectively. Another critical challenge is improving the methods for collecting and validating learner-level data. Too many states rely on self-reported information without confirming that learners successfully completed a work-based learning experience, verifying that the industry-recognized credentials reported on school data submissions were awarded by credential providers, or documenting that learners earned postsecondary credit for completing dual or concurrent enrollment in high school. Notably, 61 percent of states say they use student surveys – which have notoriously low response rates and are difficult to validate – to determine whether secondary learners go on to meaningful employment after they graduate. Thirty-three percent report the same for postsecondary learners. This information is not easy to obtain and requires clear data sharing partnerships with employers, credential providers and other state agencies. But improving the methods of collecting and validating CTE data gives critical decision makers confidence in their use of data and ensures learners, educators and community members can trust decisions that are made on their behalf. There are clear skies ahead, however, if states leverage implementation of the Strengthening Career and Technical Education for the 21st Century Act (Perkins V) to improve the quality and effectiveness of their career readiness data. Perkins V pushes states to improve data collection and reporting and make more data-informed decisions about CTE program quality and equity. As states begin the months-long process of vision setting, stakeholder engagement and plan development for Perkins V, they should consider the opportunity to improve their CTE data systems by auditing their current practices, establishing and formalizing data-sharing partnerships, and embedding data-informed decision making in policy and practice. Equipped with strong, well-aligned data systems that are reinforced by trusted methods of collecting and validating data, State Directors can use their data to chart out a path to success for learners in their state. Otherwise the institutions, learners and communities they serve will be left unmoored. The State of CTE report is based on a national survey of State Directors and examines how states are collecting, validating and using career readiness data. This resource was developed through the New Skills for Youth initiative, a partnership of the Council of Chief State School Officers, Advance CTE and Education Strategy Group, generously funded by JPMorgan Chase & Co. This resource was developed in partnership with the Workforce Data Quality Campaign, a project of the National Skills Coalition, and the Data Quality Campaign. Congress was busy last week heading into the two-week recess with activity on reauthorization of the Higher Education Act (HEA) and appropriations. Read below to learn more and find out about news from the Administration on the Innovation and Modernization grant program authorized under the Strengthening Career and Technical Education for the 21st Century Act (Perkins V) and higher education. Senator Blumenthal (D-CT) was joined by 40 additional Senators who signed on to a “Dear Colleague” letter that encouraged robust funding for Perkins. The letter was sent to the Chairman, Senator Blunt (R-MO) and Ranking Member, Senator Murray (D-WA) of the Appropriations Subcommittee on Labor, Health and Human Services, Education and Related Agencies as they begin the appropriations process for Fiscal Year 2020 (FY2020). The widespread support for the letter is a testament to your advocacy efforts! You can see if your Senators signed on to the letter in this blog post from our partners at the Association for Career and Technical Education (ACTE) – please be sure to send a thank you note to those who signed! Looking to continue to support efforts to increase the federal investment in CTE? 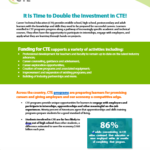 Check out www.ISupportCTE.org, the website for the campaign to double the investment in CTE. In February, the CTE community launched this shared campaign and we invite everyone to join us in asking employers to sign onto a statement that supports doubling the investment in CTE. The signatures collected from employers will be a critical component to building visibility and support for CTE with members of Congress. Last week, U.S. Secretary of Education Betsy DeVos testified before the House Committee on Education and Labor on “Examining the Policies and Priorities of the U.S. Department of Education.” In particular, the hearing focused on the proposed Fiscal Year 2020 budget. A variety of topics were covered, such as secondary and postsecondary CTE programs, expanding Pell grant eligibility to short-term programs, federal student aid delivery and support for Minority Serving Institutions and Historically Black Colleges and Universities. A video of the hearing and statements from Committee Chairman Bobby Scott (D-VA) and Secretary DeVos can be found here. The statement from Ranking Member Virginia Foxx (R-NC) can be found here. On April 15, applications became available for the Perkins Innovation and Modernization Grant Program to “identify, support, and rigorously evaluate Evidence-Based and innovative strategies and activities to improve and modernize CTE and ensure workforce skills taught in CTE programs…align with labor market needs.” Over $2 million in total are available for this grant, and up to six grants will be awarded to scale evidence-based innovative programs that lead to better student outcomes and program effectiveness. Grantees will receive between $400,000 and $500,000 for a 36 month project. Each grantee must match awarded funds with non-Federal funding sources. The one absolute priority for all applicants is to “submit a plan to create, develop, implement, replicate or take to scale Evidence-Based, field-initiatives innovations to modernize and to improve effectiveness and alignment of CTE with labor market needs and to improve student outcomes in CTE.” In addition, there are three Competitive Preference Priorities: programs that will improve STEM and computer science student outcomes; programs that serve the majority of students from low-income households and programs that serve students in Qualified Opportunity Zones. A webinar will be held by the U.S. Department of Education on April 25 to provide additional information. The negotiated rulemaking committee reached consensus on all three regulation packages proposed by the Education Department after months of hearings and rounds of edits to the originally proposed regulatory language. The panel of negotiators agreed to changes on issues such as accreditation, federal distance education rules, competency-based education, federal aid programs for religious institutions and a change to the TEACH grant program that would provide teachers whose grants were changed to loans an opportunity to appeal. In order to reach consensus, the Administration removed some proposals, such as changing the scope of regional accreditors and giving colleges receiving federal aid permission to outsource over 50 percent of a program to an unaccredited external entity. Now, the Education Department will publish the agreed upon regulatory language in the Federal Register and allow for public comments. The new rules must be finalized before November in order to be enacted in the summer of 2020. U.S. Secretary of Education Betsy DeVos put out a statement in support of the committee’s consensus. The Senate Health, Education, Labor & Pensions Committee held a hearing last week on “Reauthorizing the Higher Education Act: Strengthening Accountability to Protect Students and Taxpayers.” This hearing explored topics such as the role the federal and institutional roles in ensuring accountability and how data can better support all students. A video of the hearing and all witness testimonies can be found here. HELP Committee Chairman Lamar Alexander’s (R-TN) press release on the hearing can be found here, and the statement from Ranking Member Patty Murray (D-WA) can be found here. This year’s 2019 Spring Meeting was our largest meeting ever. We wish to thank each and every attendee and sponsor for bringing your wonderful energy and insight to make this year’s meeting one of the most memorable I’ve had in my time with Advance CTE. Nearly 300 national, state and local CTE leaders joined us April 8-9 at the Omni Shoreham Hotel in Washington, DC. Our attendees traveled from 47 states, the District of Columbia, and the U.S. Virgin Islands, and represented every aspect of CTE including secondary, postsecondary, workforce development, adult education and even the philanthropic community and other key partners. Have you become a member of Advance CTE yet? Today is the perfect day to join us! Member benefits include discounted meeting registration, which you can use at our next in-person meeting. We hope to see all of you in spring 2020 for our next public meeting. We’ll be announcing our date and location very soon! Advance CTE’s Spring meeting was full of amazing panels featuring passionate individuals committed to career readiness and Career Technical Education (CTE). 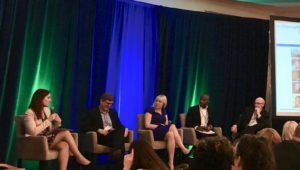 One panel – Bold Priorities: The Philanthropic Role in Advancing Quality in CTE – featured leaders from four national philanthropic organizations that have all invested in efforts to ensure more learners are prepared for success in the careers of their choice. 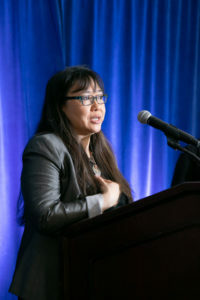 The funders’ had a lot in common when it came to their priorities – closing both access and success equity gaps so every learner can benefit from CTE pathways and programs; strengthening our data and measures so stakeholders can make more informed decisions about credentials, work-based learning and overall investments; and ensuring strong implementation by better connecting state policy with on-the-ground work. JPMorgan Chase – through Skills at Work and the related New Skills for Work – is supporting states and communities across the world to close the skills gaps and prepare learners for the future of work. The Joyce Foundation is building models of regional innovation and implementation of career pathways systems in the Great Lakes states (more to come on that soon!) and will be supporting Perkins V in the future. The Bill & Melinda Gates Foundation has identified pathways as a central focus of their new strategy, including support for Perkins V implementation over the coming years. And Lumina Foundation is evolving their work around credentials attainment to identify new models of postsecondary access and success. It was so heartening to share the stage with our philanthropic partners who are supporting such amazing work across the country! Later on Tuesday afternoon, we had a particular treat – a panel of secondary, postsecondary and adult CTE learners who shared their stories of how CTE impacted their lives. These students are examples of the best and brightest of CTE. They were incredible advocates for how CTE helped them build professional skills and networks, find their passions and set a clear path for their future. Fritza Camille, for example, a learner at the University of District of Columbia, shared how CTE has changed her life and given her opportunities she couldn’t have imagined when she left college without a degree years before. Ryleigh Travers, who attends one of Virginia’s high-achieving Governors’ Academies and taught us all about the in’s and out’s of livestock judging, talked about how she has had academic, workplace and leadership experiences through CTE that set her apart from her peers. Zackery Love, a current student at George Washington University, got his first job in the health industry because of credentials he obtained in high school as a CTE student. He shared how, as his high school’s valedictorian and a pre-med college student, he wants to push others to rethink the outdated stigma against CTE. Tony Peeler, Jr., a future student at George Washington University, has already been able to foster his passion for the law throughout high school by spending time at law firms and in the courtroom. Tony and Ryleigh both aspire to political office in the future, Zack is working to be a doctor and Fritza will be rising through the hospitality industry. These students were so incredibly impressive and inspiring and are well on their way to achieving their dreams. The day started with a panel of national data quality experts, who unpacked the report’s major findings and called participants to action. Elizabeth Dabney, from the Data Quality Campaign, urged state leaders to use data as a bridge builder to break down silos across the secondary, postsecondary and workforce sectors. Ryan Ryena, from Education Strategy Group, echoed this idea and pushed states to go further and leverage their collective power to make bold improvements in the quality of their data. Bringing in the workforce perspective, Bryan Wilson from the Workforce Data Quality Campaign – a project of the National Skills Coalition – highlighted opportunities to align accountability and data collection between CTE and the Workforce Innovation and Opportunity Act (WIOA). After an engaging discussion on the power of high-quality data, panelists broke out to lead a series of breakout sessions on data quality and effectiveness, including topics such as aligning cross-sector data systems or measuring a “high-quality” program. The full State of CTE report will be available on April 18 in the Learning that Works Resource Center. Perkins V: How can states effectively leverage labor market information? The Strengthening Career and Technical Education for the 21st Century Act (Perkins V) puts an increased emphasis on the use of labor market information (LMI). Perkins V includes an amendment to the Wagner-Peyser (Title III of the Workforce Innovation and Opportunity Act) to ensure that labor market information produced under Wagner-Peyser can be readily accessed and used by the states and in turn, local recipients. In addition, the law requires an analysis of how CTE programs are meeting labor market needs as part of the comprehensive local needs assessment that local recipients of Perkins funds must complete. Labor market information is also one component of how states may determine which credentials should count as recognized postsecondary credentials (a term that is defined in Perkins V and used in the accountability system). How can states effectively leverage labor market information when approaching implementation of Perkins V? Check out the resources below to learn more. GUIDE: Putting Labor Market Information in the Right Hands: This guide is designed to help states think through the process of disseminating LMI more strategically. The guide highlights different states approached and their dissemination of LMI to employers, districts and learners, and poses guiding questions for states to consider for each of those audiences. BRIEF: Credentials of Value: State Strategies for Identifying and Endorsing Industry-Recognized Credentials: This paper highlights promising practices from states that have made considerable progress developing a system for students and employers to navigate the tangled universe of credentials. The brief further describes how each state tackles the challenge in a different way, building a system that suits their local economy and context, and highlights a few common strategies. Kansas: Excel in CTE: Excel in CTE was launched in 2012 to help students transition to postsecondary education and training by increasing industry-recognized credential attainment and dual enrollment. The program has grown substantially since then, serving more than 10,000 students a year. Florida: Career and Professional Education Act (CAPE): Florida’s CAPE Act, initially passed in 2007, models how states can engage with industry and define quality industry certification standards for secondary and postsecondary students. Looking for additional resources? Please be sure to check out the Learning that Works Resource Center. Posted in Uncategorized | Comments Off on Perkins V: How can states effectively leverage labor market information? Are you willing to include the campaign to double the investment in your next newsletter? In February, the CTE community launched a campaign to double the federal investment in CTE! This is a shared campaign and we invite everyone to join us in asking employers to sign onto a statement that supports doubling the investment in CTE. The signatures collected from employers will be a critical component to building visibility and support for CTE with members of Congress. This new bi-monthly newsletter will keep you updated on the campaign and provide you with Tweets and resources to spread the word about the campaign! Are you willing to help us get the word out about the campaign by including it in your next newsletter or e-blast to CTE champions? Do you have email lists that reach employers, state CTE administrators, Career Technical Student Organizations, deans of workforce education or community college presidents? You can use or adapt the sample newsletter and email language in the promotional toolkit in your communications. Our goal is to secure 10,000 employer signatures by April and every signature counts! You can also use the featured resource, blog, and Tweet below to spread the word about the campaign and encourage employers to sign on. FEATURED RESOURCE: Check out the one-pager on the double the investment campaign. It’s a quick read that you can link to in your newsletter or e-blast to CTE champions or use as a leave-behind at meetings. Find additional resources, including an “I Support CTE” sign, PowerPoint, and CTE graphics on the share page. JOIN US ON SOCIAL MEDIA: Sample Tweet: “73% of Americans say increasing federal spending on K-12 public education is extremely important. ISupportCTE.org #ISupportCTE” Use #ISupportCTE when you share your support for the campaign! Posted in Uncategorized | Comments Off on Are you willing to include the campaign to double the investment in your next newsletter? This post is written by Microsoft, a Diamond Level sponsor of the 2019 Advance CTE Spring Meeting. Providing the technical and soft skills students need to thrive in a digital economy can seem like an overwhelming task, and the rapid pace of change in the workforce is creating a global skills gap. As one example, the demand for next-generation artificial intelligence (AI) skills has far outpaced the number of candidates in the job market. A recent estimate suggests that, by 2022, a talent shortage will leave as many as 30% of AI and data skills jobs open. We know that as emerging technologies and tools from Artificial Intelligence to Machine Learning to Cloud Computing transform the modern workplace, skills requirements for students are changing rapidly as well. And we also see first-hand that education leaders and policymakers around the world are striving to address this imperative – seeking innovative ways to address the skills gap and boost the talent pipeline for economic competitiveness. Microsoft is committed to making this space of technical and employability skills education in schools — and through CTE — a priority across the US and in markets around the globe. The flagship Microsoft Imagine Academy skills program is designed as a partnership opportunity with K-12 high schools as well as middle schools to help deliver meaningful, relevant and valuable skills-based learning programs with outcomes of Economic Development, Entrepreneurship and Employability. The program features four in-demand learning and career pathways of study: Computer Science, Data Science, IT Infrastructure/Cloud, and Productivity. Plus, students and educators can pursue globally recognized Microsoft certifications through our partnership with leading exam delivery provider Certiport. Throughout our company history, partnership has been a hallmark. We value and appreciate strategic alliances such as those forged with Advance CTE and its member institutions and CTE leaders across the country. Our mutual policy focus in support of Perkins reauthorization this past year represents a shining example of our alliance and joint commitment to CTE. We are also committed to work with your member state school system leaders, districts, and schools to promote the value of technology and computer science education for student achievement in every school. From a Microsoft perspective, it’s our pleasure to continue to strongly support the mission of CTE, and we appreciated the opportunity to serve as a sponsor for another fantastic Spring Meeting 2019 for Advance CTE this past week in Washington, DC. As Allyson Knox, Senior Director of Education Policy and Programs, Microsoft, said in her remarks at the conference, “Our missions are aligned in many ways, and most importantly, in our collective effort every day to empower every student to achieve more in a digitally transforming world.” If you’d like to learn more about the array of Microsoft skills and education programs available for schools to boost student and educator opportunities check out the digital skills resource page here or please reach out to Roberta Reischl, part of Microsoft Education, Future-Ready Skills Team. 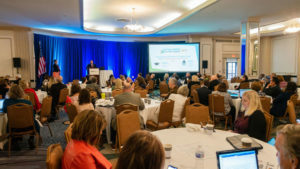 This post is written by NCCER, a Platinum Level sponsor of the 2019 Advance CTE Spring Meeting. Somewhere along the way, we have lost sight of what the American Dream is. We’ve begun equating success with a career path only achieved through a four-year academic degree or higher. Our workforce has suffered from this mentality of only valuing the so-called “white-collar” professionals in our economy. We are facing workforce shortages of skilled workers that will only increase as seasoned Baby Boomers retire. What can we do to change this? One key to transforming our workforce development system is these three numbers: One. Two. Seven. Only one job out of ten requires a master’s degree or higher. Two out of ten need a bachelor’s degree. And the remaining seven? These only need an associate degree, certification, craft training or credential. Our current perception of what a successful career is only focused on 30 percent of jobs. Skilled professions, those that call for certifications, credentials, on-the-job training, often face three misconceptions: They are not lucrative. They are low or middle-skilled. They are dead-end jobs. Let’s bust these three common misconceptions, particularly in the construction field. A popular misconception is that “most well-paying jobs require (at least) a college degree, and getting one of those requires a significant portion of young people to essentially forego owning their own home (part of the much venerated ‘American Dream’) for years and years.” In fact, well-paying jobs are readily available and don’t require sacrificing the typical physical representations of success. Cameron Campbell, millwright, and Josh Chavers, welder, share how they’ve been able to afford brand-new trucks, homes and vacations because of the opportunities they’ve found. Often overlooked, the construction industry provides sustainable and lucrative careers, like Cameron and Josh’s. CareerBuilder and Indeed both listed construction positions as some of the best jobs to get ahead in 2018. The industry is estimated to need 1.4 million skilled craft professionals by 2022, and with 41 percent of the current construction workforce set to retire by 2031, opportunities are only growing. 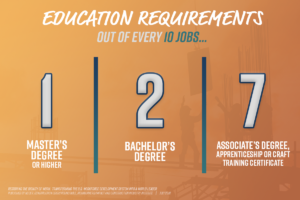 In fact, multiple careers in construction make a national average salary (without overtime, per diem or incentives) over $65,000 and do not require a four-year degree: boilermaker, mobile crane operator, millwright, industrial electrician, and welder, just to name a few. Forty-six percent of U.S. employers are having a difficult time hiring because they can’t find the skills they actually need in the workforce. Despite offering great salaries, many of the most in-demand jobs are not only ignored but rarely shared as viable options or are only presented as ‘if you can’t succeed in the academic world’ jobs. These careers are made fun of in TV shows — remember the SNL skit poking fun at project managers? Or construction workers only shown as digging ditches? They paint a picture of jobs that people only pick when they can’t find anything else. But let’s take a minute to consider the skills a career — and not just a job — in construction really entails. Pipefitters calculate as many, if not more, mathematical equations in a typical workday than an engineer. Welders have to make sure their welds can hold up beams that support tons of weight — and I literally mean tons as a measurement and not figuratively. Electricians have to understand complicated systems and electrical components, as well as stay up-to-date on national, state and local codes. Blue-collar and white-collar careers remain pitted against one another, and a path toward a blue-collar career is undoubtedly portrayed as the less desirable choice. If you have ever tried to construct, install or repair any number of complicated projects in or on your own home, you know that highly trained professionals are anything but replaceable. Instead, they are essential to the longevity and functionality of the places that mean the most to us. These misguided terms used to describe craft professionals fail to represent the rigorous training, credentials, professionalism and strong work ethic belonging to the individual underneath the hard hat. By referring to them as anything other than highly skilled professionals, we are ultimately devaluing the work they do and decreasing the appeal of entering these careers. Performance-driven jobs put workers in charge of their career progression. A career as a craft professional has a lot of potential — to advance from entry level to fully trained to seasoned craft professional can take eight to 12 years, and leadership positions are entirely achievable, from management to CEO. 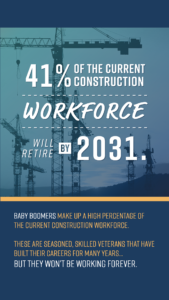 In fact, management jobs in the construction industry are going to be impacted even more severely by the Baby Boomers retiring, leaving the door wide open for craft professionals to expand their careers — 67 percent of the seasoned construction management is due to retire by 2031. Because construction is mostly performance-driven, you are the determining factor in how far you climb the ladder of success. Boyd Worsham is a great example: Boyd started as an apprentice directly out of high school, worked his way up to become a journeyman carpenter, foreman, assistant superintendent, superintendent and finally the vice president of construction support for The Haskell Company and is now the president of an international education foundation, NCCER. Ultimately, what do we want for our children and students? Do we want them to only focus on achieving an academic degree or would we rather see them find success on a path they may not have considered? Regardless if a four-year degree is required, we should want the next generation to find satisfaction, happiness and success in their field. And construction workers are happy. The 2015 Best Industry Ranking Report published by TINYpulse surveyed more than 500 organizations and over 30,000 employees across 12 distinct industries and found that construction workers are the happiest employees. Why wouldn’t they be? With lucrative careers and growth opportunities, craft professionals are not only successful but have pride in their chosen path. The world as we know it, from our hospitals and roads to our schools and houses, would not exist without the expertise of craft professionals. Let’s not discount career paths just because it may not fit our misguided idea of success, but rather rediscover the American Dream and encourage all options to be explored.